Who do you think I am, Scooby Doo? You sit over there, where you will be safe. I’ll do the dangerous stuff. 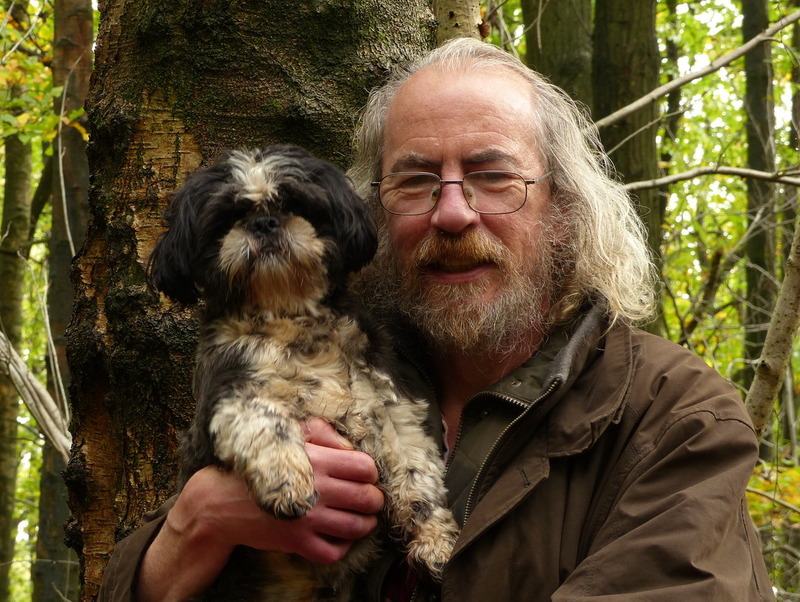 Today Fizz and I have gone to the woods to photograph a tree previously believed to be possessed by demons. When we got to the wood we met a nice man called Sam who was collecting Chestnuts. This wood is an old Sweet Chestnut coppice. It is neglected and the trees are mature, there is a good crop of chestnuts. Sam works for a company who sell tree and shrub seed. He offered me £2 a kilo if I would collect chestnuts for him. He wants to buy a hundred kilo’s at a time and thinks that I could collect them in one day. It is a tempting offer. The trouble is that I don’t drive and I can’t carry a hundred kilo’s of chestnuts. Do you think Fizz could pull a sled? I am just rabbiting on here to take Fizz’s mind off the danger. This is the tree in question. It is an apparently healthy Silver Birch with plenty of leaves on it. So what do you think this next picture is? A mushroom? It doesn’t look like a mushroom to me. There is something very dark inside this tree and it is bursting out of it. You just think about pulling your sled. There is something in this tree and I would like to know what it is. I first saw this tree about a year ago. As a naturalist I have trained my mind not to jump to conclusions without proof and without getting things confirmed by the experts. Well, I don’t know any demon experts. I decided that this tree was most probably possessed by the darkest sort there is and that we should probably avoid this area at night. That was until a few days ago…. The blog is written by Hazel Stark and she writes, “Anyone who has lived around birch trees has probably seen it, but not known what it was.” Hmmm… So I did some more research. I think we might be about to put a name to this demon. It is a demon and it has possessed this tree but it is one of the lesser ones and it can not get out and chase us around the wood except on Halloween. Inonotus obliquus is a parasite and it will kill this tree, so technically that makes it a parasitoid. While we have got the tripod out would you like to have your photograph taken with me? I am just trying to lighten the mood for her a bit. It is not a mushroom, we were right about that. A mushroom is the fruit of a fungus but this is the body of the fungus, called the mycelium. This is the part of a fungi that you would not normally see because it would be inside of the tree. There will be some inside of this tree but it is also bursting out. 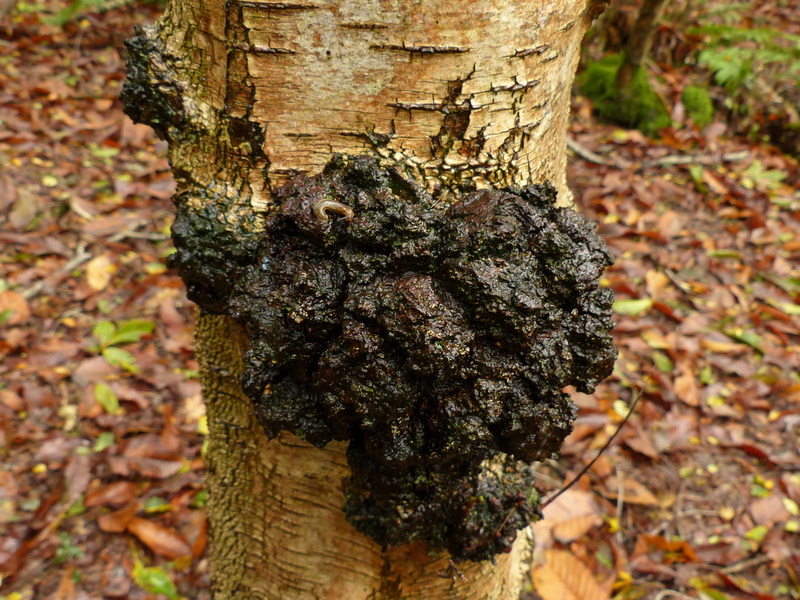 Chaga fungus is a medicinal fungus. Unproven in clinical tests but then so are my demons and I know that they exist. 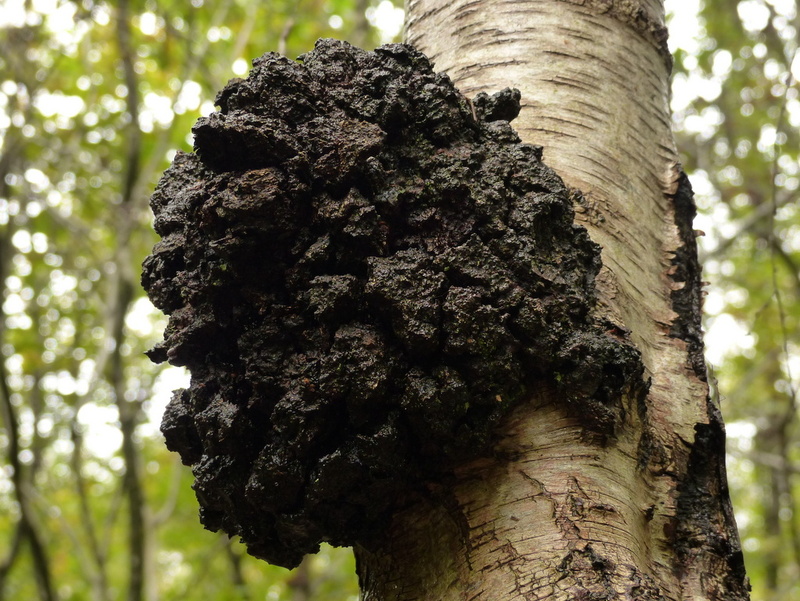 Chaga is used in the treatment of cancer and taken in the form of tea. Hazel goes into some detail about how to prepare it and how to make the tea. You should read her post for more information. 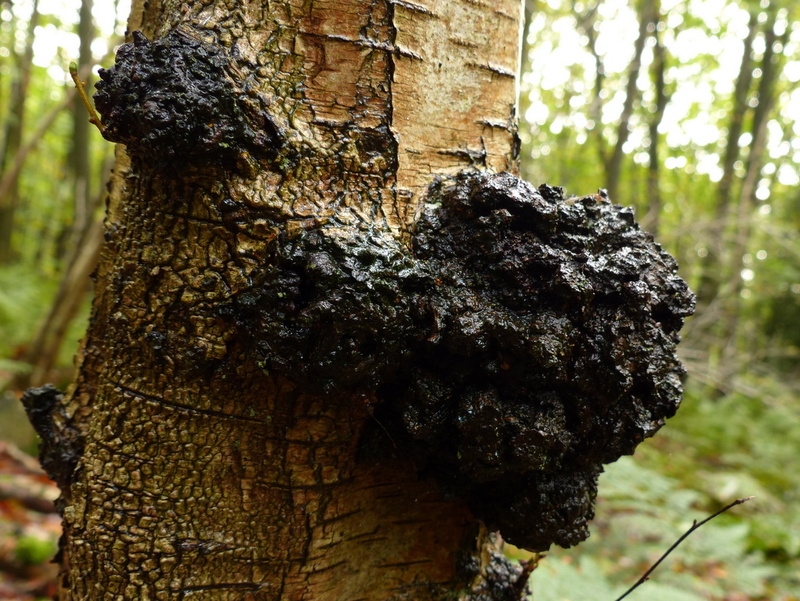 You do not have to find and harvest Chaga in the wild it is easily available to buy. Just Google for it if you want it. 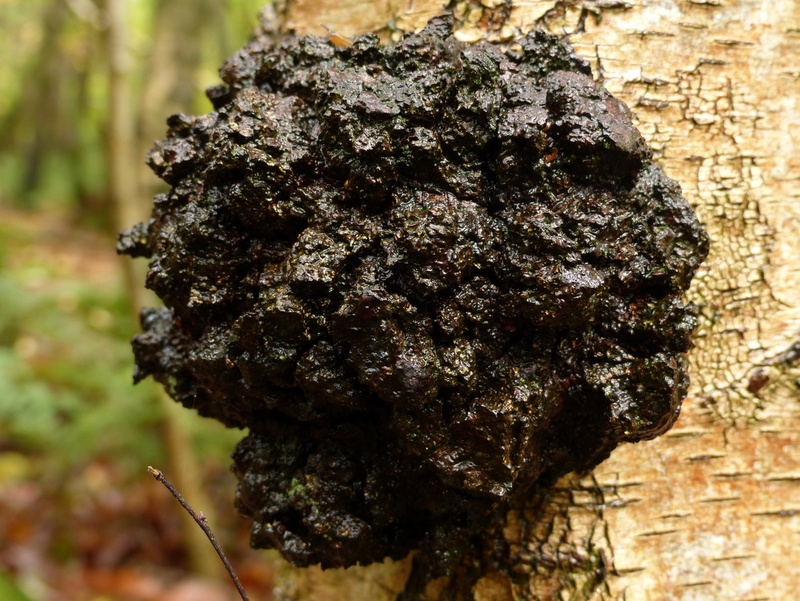 Chaga is also known as Tinder Fungus and that interests me. I want to do a post about starting fires soon. I couldn’t get it off the tree with my little knife, it is quite tough old stuff. An axe is required, I am told. We will have to come back with something heavier. I just want to take a little bit of demon home with me. Very brave of you both!! As always, a great balance between information and entertainment. Thanks for you lovely posts. I really enjoy them. Very pleased to hear that Justine 🙂 Thank you for reading. I spent the day fishing yesterday. 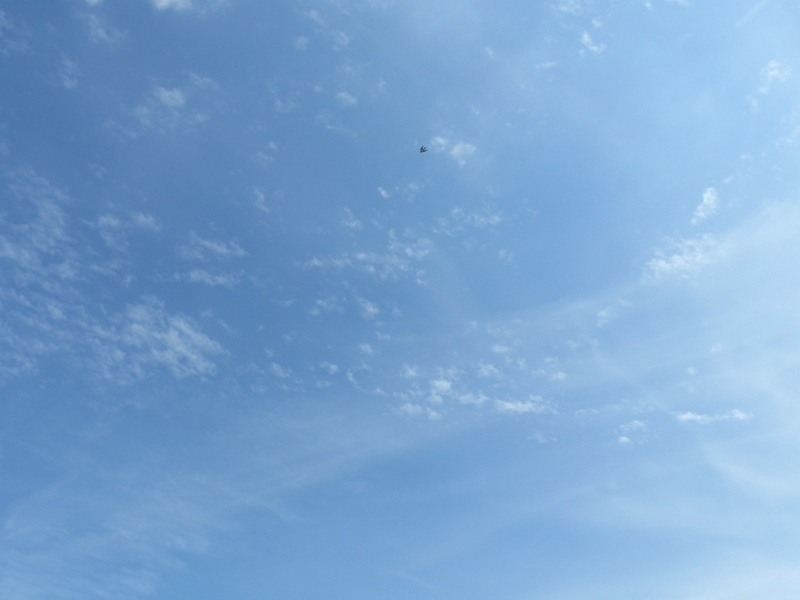 Saw two beavers, a gray heron, two butterflies, turtles…….a good day. That is really interesting. I learn each time I log on to your blog. Thank you for sharing info along your travels. I am so glad you have dear Fizz to accompany you. Thank you Ettel 🙂 I am very grateful for Fizz’s company. Especially when we are doing something dangerous. I always hope the dangerous thing will chase her instead of me 😀 (Sorry Fizz) but she can run faster than me. 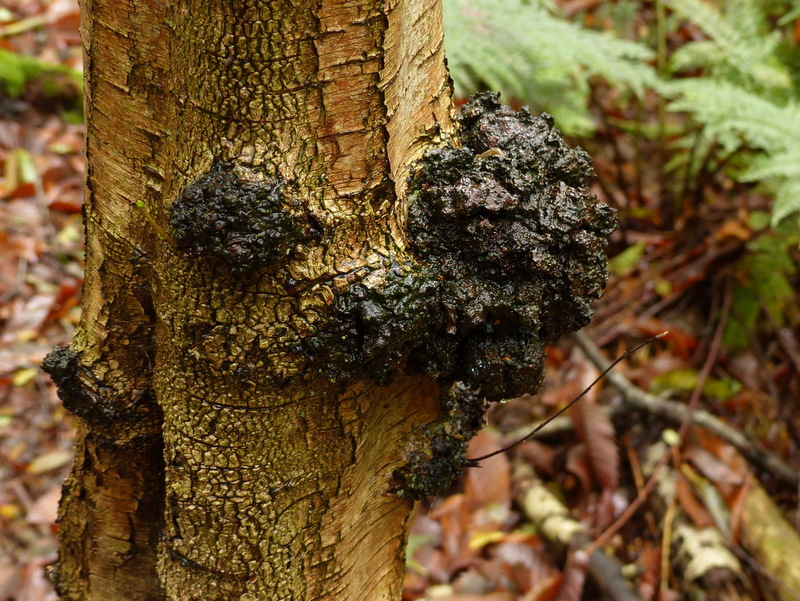 I also found that Nature plays tricks, if you will….the Chaga will kill the tree eventually, but brewed into tea it will help in curing cancer!!! I’m glad you took time to photo yourself and Fizz. Such a fascinating and interesting read dear friend. 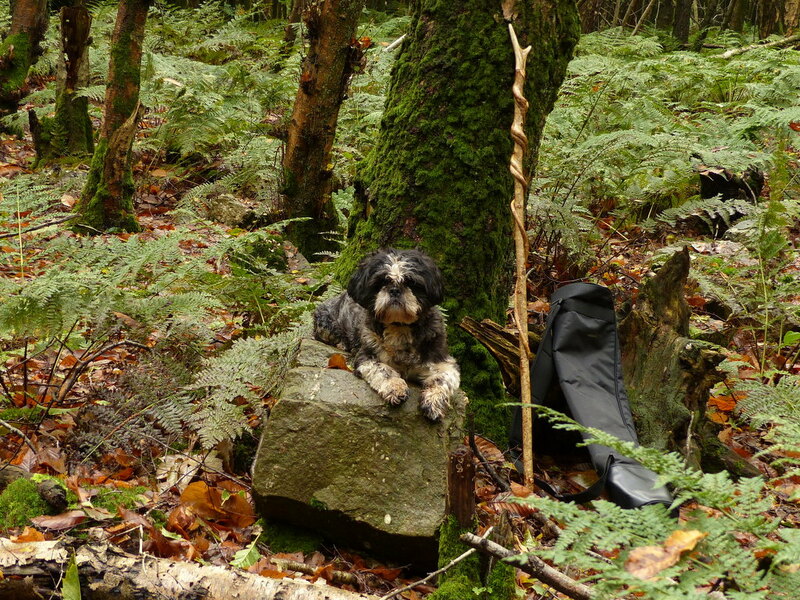 I found myself sitting at the edge of my comfy seat with intrigue, wonder and fear for wee Fizz. hehe 😉 I always find this space of yours so welcoming, it’s like sitting down for a chat with friends…human kind as well as the furry kind. Much love and peace to you and Fizz! Thank you Matthew 🙂 I look forward to your posts in just the same way. I am looking forward to your next trip. Ah! but what about Bandit? I suppose that he will be looked after along with the horses. 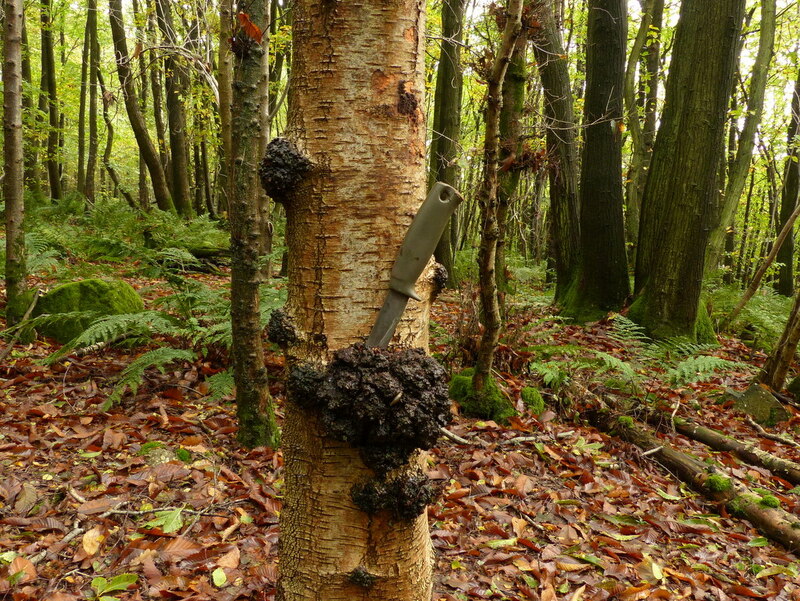 Once the birch has died and been totally taken over by the Chaga Fungus I wonder how long the fungus lives afterwards. I presume it would eventually produce fruiting bodies and the whole process would begin again. I also wonder how long the fungus has been living in this tree. Yup, these are seen around here too. £200 for a guaranteed back back…not my cup of tea! Thanks Stephen 🙂 I probably won’t get involved with the collecting. Apart from the bad back it is often very prickly work and just my personal foraging can be quite painful.I am tempted though because Sam has access to private land where I have often seen Deer. I was going to say the tree has cancer, only to have you write it’s used to treat cancer. You’re the second to write of sweet chestnuts. I’ve never had one to taste. We have horse chestnuts I gather (autumn encourages gathering on walks) for examination, but they aren’t edible. Thanks Sammy 🙂 It is hard to imagine a world without chestnuts. 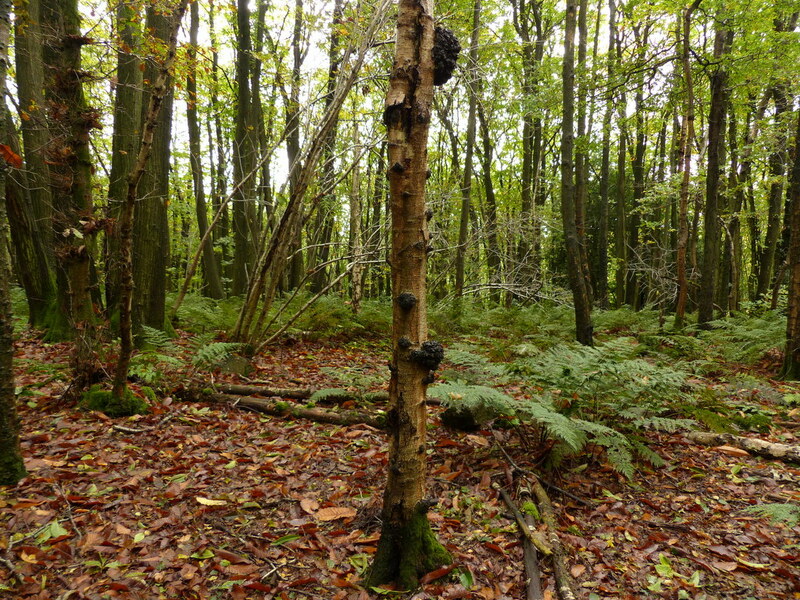 Most of our woodland in Southern England was converted to Sweet Chestnut coppice about two hundred years ago. It was once a major industry here and chestnut poles were grown to support the hops that fuelled our nation. Then somebody invented wire and the bottom fell out of the sweet chestnut market. 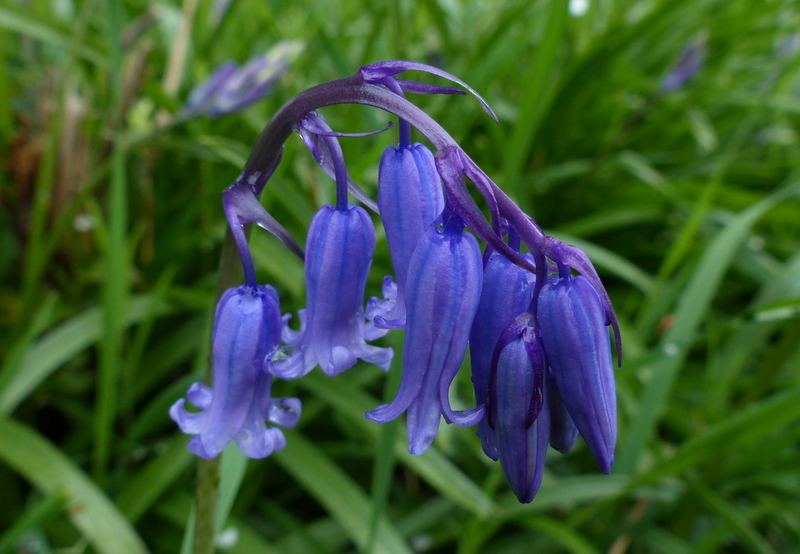 At one time it provided work and a way of life for many people but the creation of all of this non-native woodland must have been devastating for our woodland wildlife and the legacy remains. Most of the Sweet Chestnuts that are eaten here are not home grown, they are imported from warmer southern climates where the fruit grows bigger. 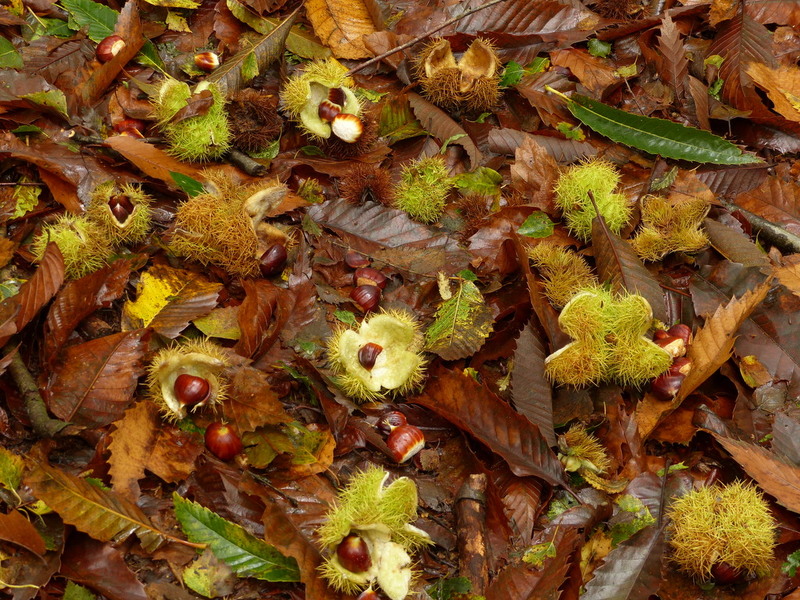 English Chestnuts are not regarded as a crop and most go to waste. Thank you so much for that interesting piece of history. I haven’t had the pleasure of viisiting England – yet- but Dad instilled a deep love and curiosity in me for forests and, in particular various trees, leaves, nuts and the creatures who thrive among them. What an interesting thing and by golly, you figured it out, as we knew that you would! 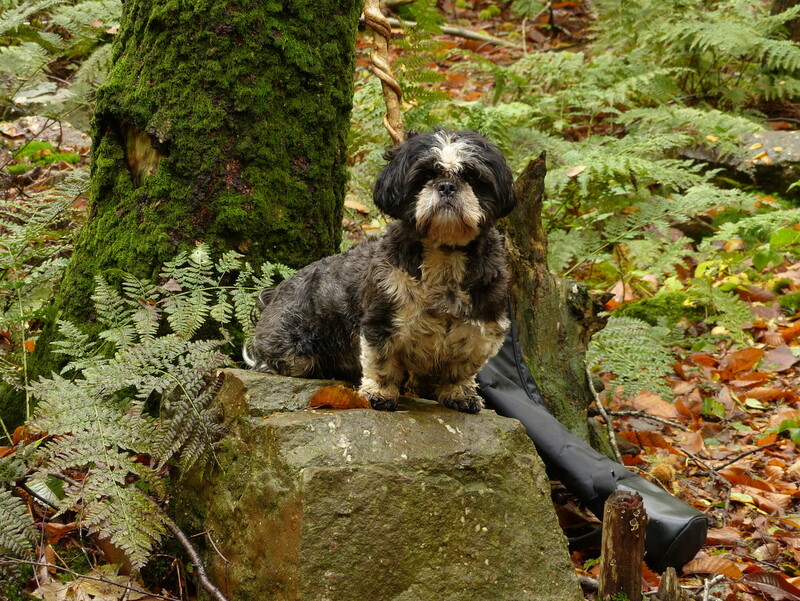 Maybe since you explained it Fizz won’t be scared any more. It’s a shame that it will kill the tree. Good luck getting a piece to take home…don’t cut yourself. Thank you Sarasin 🙂 Now that I have found it I need to chop a little bit up, just to play with it a bit and to see what’s inside. Thank you Eliza 🙂 It is an extraordinary fungi. Discovering this one makes me wonder how many more there are still to find. If they are there, I’m sure you will find them! Very interesting to read about that fungus ! And .. lovely picture ! Thanks so much for the shout out! (By the way, I think the pingback did indeed work by linking—also I believe I am posting this comment on my blog and yours…the internet is more mysterious than the forest, eh?). I’m so tickled to see your demon tree! There’s one thing I should have mentioned in my post (I’ll update it next). 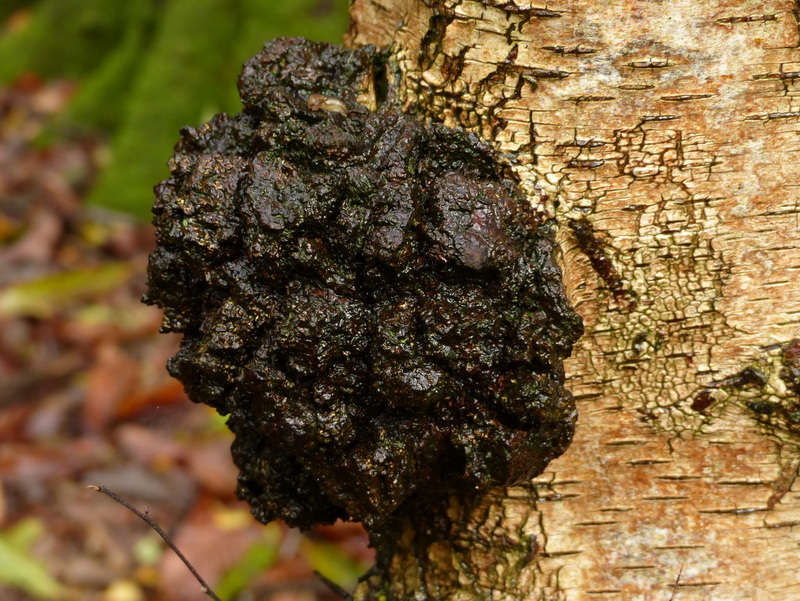 When chaga is smaller, it may be confused with a tree burl. The way you’ll know is when you break it off and scuff off the black stuff, you’ll see that lighter brown/amber color I mentioned inside. 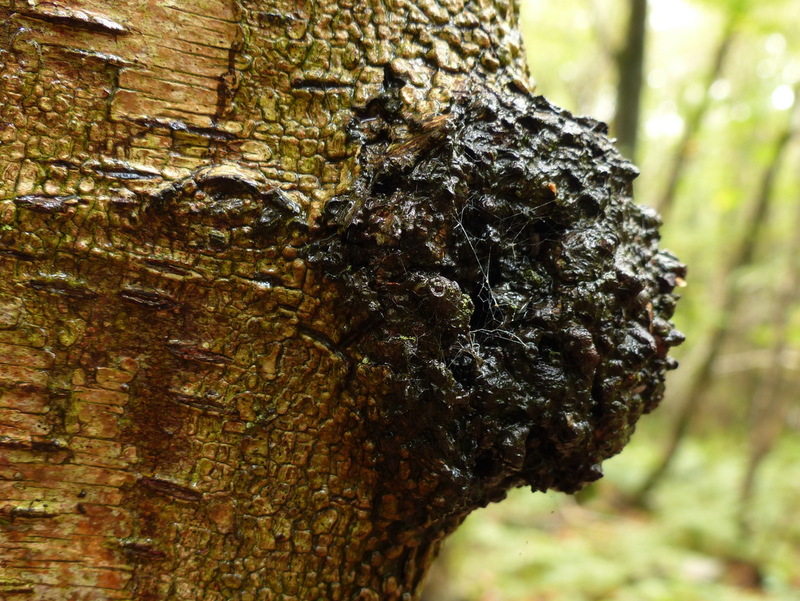 Chaga also should be able to come off the tree fairly easily–just a firm whack with the backside of a hatchet should do the trick. It’s much easier after a few days of soaking rains. 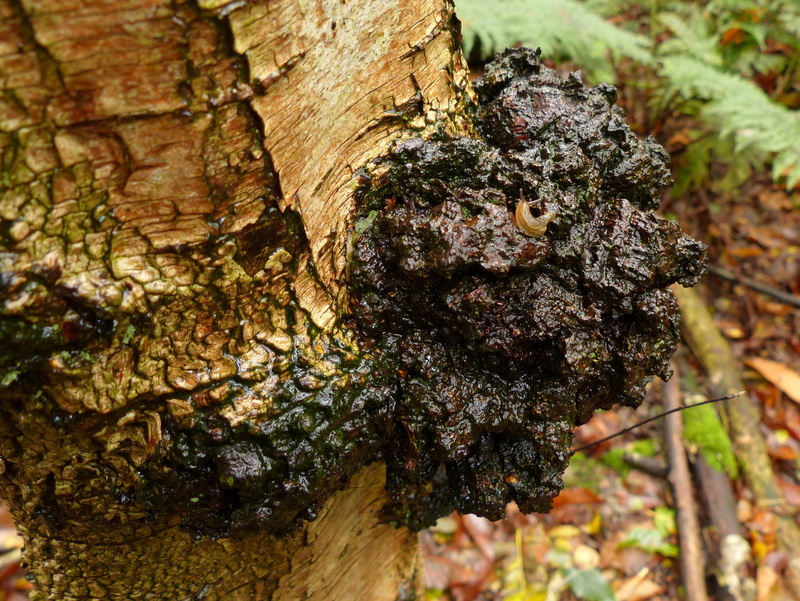 If it doesn’t work, check on it regularly and see what demonic thing it continues growing into…Your photos make me believe it’s chaga, but it is on the smaller side and if it’s hard to get off the tree, that may be a clue that perhaps it’s a demonic burl! Feel free to send me pictures of the inside if you get it off! Amazing find and great story, nonetheless! 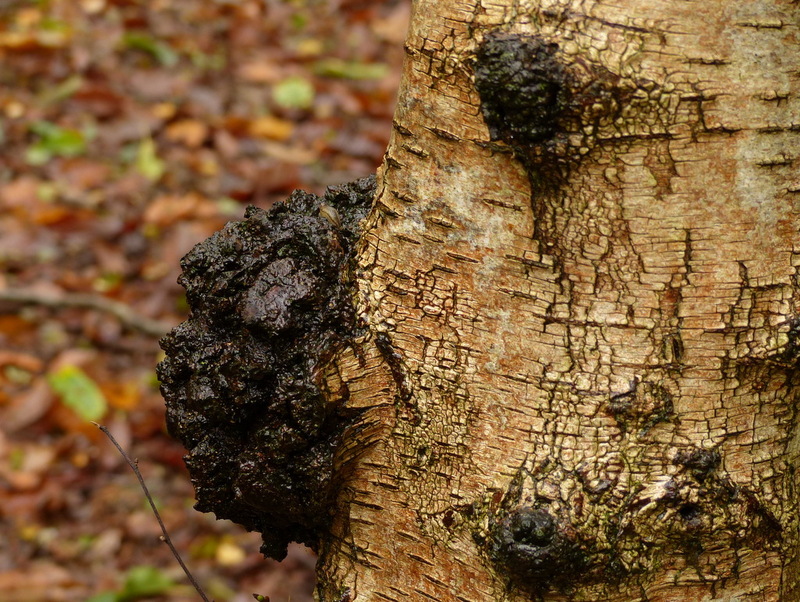 I’m 95% sure it’s chaga based on your photos and the fact that it’s on a birch. 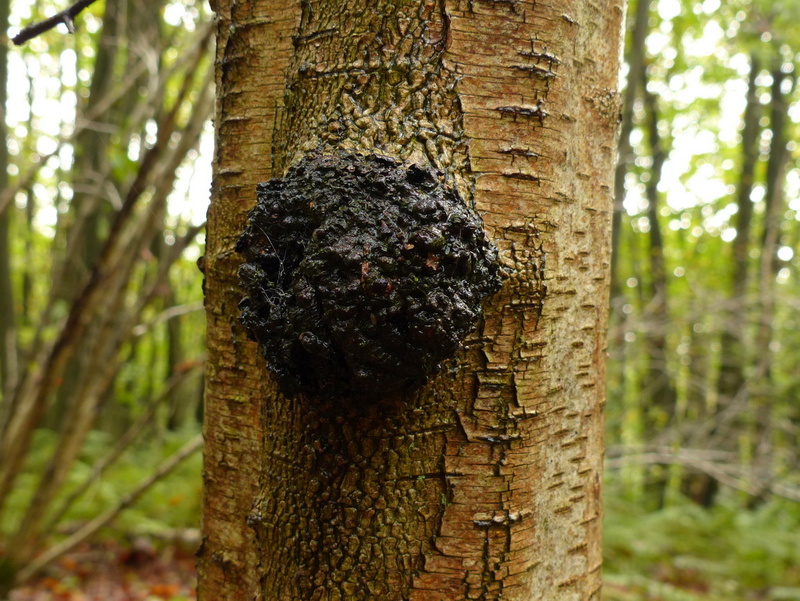 (Burls are even more mysterious than chaga; I tried to do a research project on burls in college but found that there has hardly been any research on the topic!) Thanks again for linking to me! I look forward to hearing what you find out! It would be remarkable in itself to have a burl that looks that similar to chaga! I love your posts. Keep em coming! Excellent post – witty, informative and spiced liberally with good photos. 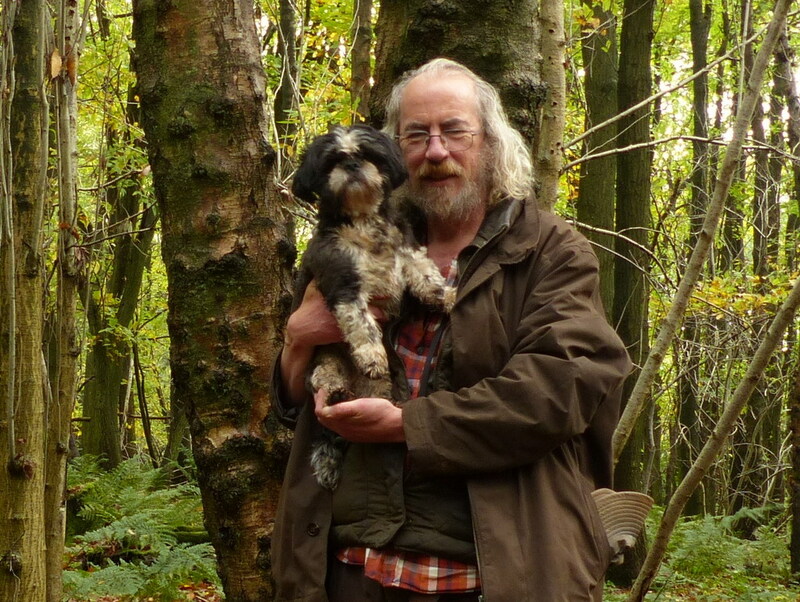 The naturalist and his trusty fun dog (like a gun dog but more relaxed). 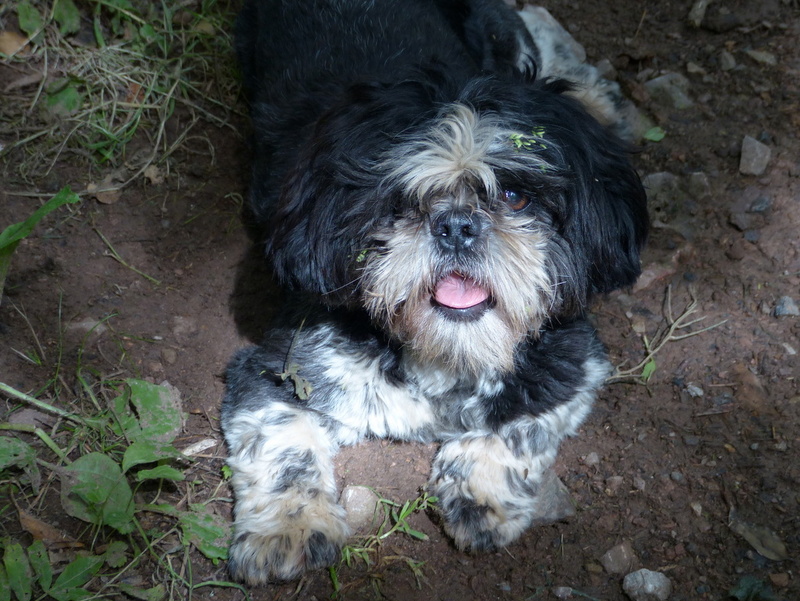 Fizz is a natural in front of the camera. We have a chestnut seller locally. He is to happiness what Long John Silver was to philanthropy. The most surly old blighter I have yet encountered. I’m with you. A demon definitely lives in that poor tree! Great post, Colin. Lots of fun. Thanks for the wonderful photos! Happy Trails! I’m sure Fizz feels protected with you. Sorry I’m so late responding. I haven’t created anything in a while. I’m learning several new effects to use in my designs. I get bored if I’m not learning something new. Gotta keep my mind young. Happy Trails!